Strategic Asset Management vs. Work Management–What’s the Difference? How much are we spending on maintenance? How long does it take us to respond to and fix an issue? Are we meeting Federally mandated requirements? The IAM defines asset management as the “coordinated activity of an organization to realize value from assets”. This involves the “balancing of costs, opportunities and risks against the desired performance of assets, to achieve the organizational objectives.” An additional objective is to “minimize the whole-life cost of assets but there may be other critical factors such as risk or business continuity to be considered objectively in this decision making.” All of these factors can be combined together to make informed decisions regarding how assets are managed and maintained throughout their life-cycle. These decisions involve monetary expenditures, but they also involve strategic thinking centered on the “How” and “Why” to fix an asset as well as “When” and “Which” portions of this process. This is the “Strategic” piece of an Asset Management system. Work Management is one small component of Asset Management. It is typically focused on the day-to-day operations and expenditures related to operating and maintaining asset infrastructure. The Work done against an asset can track cost information, but can also be used to build a strategy around the operations and maintenance related to that asset. This strategy focuses on the “How” and “Why”. It answers what “Activity” should be completed for an asset (Install, Maintain, Repair, Replace) and “Why” (It’s old, looks bad, is dangerous, could cause injury, get us sued) this should happen. Next, it answers “When” (now, next year, or never) an asset should be maintained as well as “Which” (most critical, most likely to fail, the Mayor’s sewer line) assets should get priority. 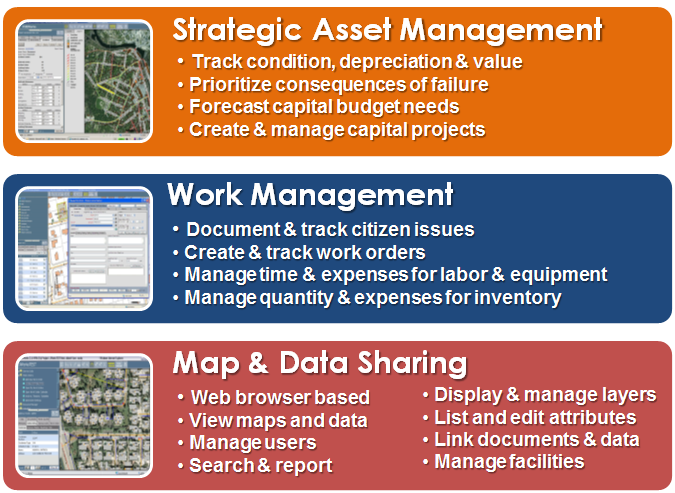 All of these factors are important and ALL of them should be utilized when making a Strategic Asset Management decision. Be reminded that Work Management is only one component of this decision-making criteria which is applied to an overall Strategic Asset Management plan.